The Samsung Galaxy SII is still one of the best phones available to buy today, hell, some of you might even argue it's still the number 1 best phone you can get your hands on right now... and who am I to argue? At the very least, it's still up there. So some of you may still be wanting to grab a Galaxy S2 case right? Well the guys over at Mobile Fun have kindly sent me a Genuine Samsung Galaxy S2 Mesh Vent case. Lets jump into the review and see if the case lives up to the awesome sounding name! The packaging is pretty non-existentÂ really, it's literally a small plastic film bag with a barcode on. Now you don't normally purchase cases for the packaging so really this shouldn't be a big deal, but this case is supposed to be a genuine (I've no doubt that it is genuine btw) case so you'd really expect something more substantial. But once again, this shouldn't matter much as I'm guessing 9/10 of you throw the packaging away almost immediately (the 1/10 Â of you should be ashamed/proud for being such a huge geek!). The good thing about minimal packaging like this is that the price of the case isn't artificially inflated to take expensive packaging into account, so generally speaking the less the better. Very, very simple. The case clips on very easily, and it never feels like it will break or snap in the process. The top "rim" of the case come in slightly so that when the case is actually on the phone it sort of clips in. It's a good design element and helps to add confidence that the phone will never slip out of the case. I have to add that I worry about applying and removing the case because it is quite tight it pushes the volume rocker and power button in during the actual process of application/removal. Now I've had this case for a while and both the power button and volume rocker are as they were when I bought the phone (since it was released here in the UK, in other words a long time), so that worry is most definitely unfounded. You generally won't be taking the case off much anyway so again not really a big (or even a small) deal. This case is made using "Â aÂ contemporaryÂ mesh material", really it's a smooth plastic like substance. It's quite strong, but flexible. You can twist the case about a bit and it won't lose its shape or rigidity at all. It feels smooth to the touch which is nice, in fact I much prefer the feel of this case than the feel of the Galaxy SII itself. The back of the case contains a small shiny silver Galaxy SII logo. 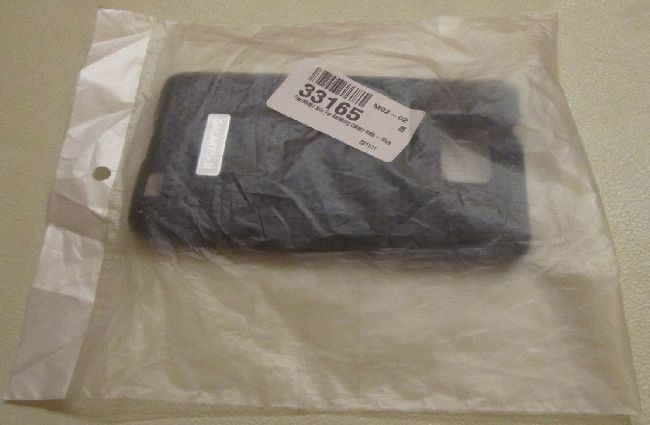 Looking at the pictures of this before actually seeing the case in person had me worried, it did look a bit cheap. However, in person this is a nice touch to the case, not too shiny and adds to the "cool" look of the phone overall. The back of the case is meshed, like the name suggests. It's very nice, it adds something extra you wouldn't get with a case with a standard, boring back! One of the most popular aspects of the Galaxy SII is theÂ thinnessÂ and lightness of the phone. Personally, I hate cases that add bulk and weight to this device, in my opinion they uglify the phone somewhat. You'll be happy to know that this case really doesn't add much at all to both of these factors. The phone still feels light and thin with the case on, definitely a huge plus for me. The case covers the back of the phone, and both sides. The front screen, bottom and top of the phone are not covered at all. This is most definitely not the choice for you if you like your phone fully protected. Having said that, it does offer some protection. The back is fully protected from scratches, as are the sides. The side protection actually rises slightly higher than the phone, meaning if you lay the phone screen down the screen doesn't touch the floor. This actually offers a decent amount of protection to the screen if you do happen to drop the phone. I know as I've done this myself. The case has cutouts on the left for the volume rocker and speaker, while the right has a cutout for the power button . As mentioned earlier, the top and bottom of the phone are not covered at all so the 3.5mm headphone jack and the mhl/microusb port are completely free. This case is my favourite case for the Galaxy SII, in fact I might even go as far as to say its one of my favourite cases for any phone. The main reason is due to the lack of bulk or weight the case adds to the phone, whilst keeping the stylish look and adding at least some protection. The case is also available in multiple colours so there is something there forÂ everyone'sÂ taste.